Success! I Mastered the French Macarons!! After my first attempt in making some French macarons last week, I made another batch...and this time without Dylan's "help." and what do you know? ?....it was a TOTAL success!! I decided to experiment with making coffee macarons with Irish cream filling. And I have to say....It was AWE-SOME!!! (other people agreed with me.. just so you know, I'm not making this up) Will...I'm sure some real Macaron conisseur would disagree and nippick them, but I was happy with how it turned out as it was only my second attempt in making them! So Check it. This time, I made sure that ALL the ingridents got mixed. I beated the egg whites to a shiny stiff peak, I replaced a quarter of the almond flour with finely ground coffee beans and carefully folded in with the egg whites. I piped it and it actually looked like how it's supposed to..stiff and shiny! Coco&Me has step by step photos of how they're supposed to look like, which is super helpful for a visual learner like me. Then I put it in the oven..and I discovered something new that's different from what Martha's recipie said to do. I actually set the oven to 325degree instead of 350. And left the door slightly open...you can use either a metal or wet wooden spoon. I baked it for 5 minutest first and then turned the pan, and then baked it for 5 minuets more and it was perfect. Martha said to bake it for 15 minutes, which I feel like it would of burned it...I also placed another pan on the existing pan, so no direct heat was burning the bottom of the macarons (this was not mentioned in Martha's recipie) Sorry Martha, I have to disagree with you on this one! I think every oven heats up differently, but it's better to bake it for less time to check on it before it's too late. And Voila! I got the so-called "foot" where it's slightly crusty on the bottom edge and the top is smooth and round...they're so cute! Hmm....the possibilities are endless. Any other ideas?? Guest Blog on Poppytalk for the New Year! This week Jan from Poppytalk invited L&G to be a guest blogger!! Hurray! Dylan and I are super excited about this one where it's about celebrating the new year. 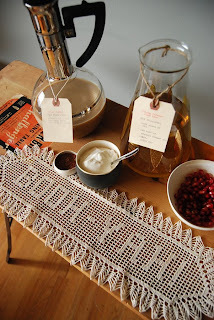 It's a instructional post about creating an easy and impressive mix-your-own cocktail bar. What is this about?? Well...to summarize it, it's about expanding your New Years drinking options that's beyond cheap champagne. It's about making the guests feel like they're participating in something fun while in reality, it's about you doing less work and having more fun at your own party for once. And even with you putting all your guests to work...you'll still be rewarded by the praises from your guests. You can say BOOH-YAY! to that my friend. Read all the details on Poppytalk about how to make this into your reality! Here are some drink recipes to jump-start your ultimate New Year celebration party! Make the coffee (stronger the coffee the better), add sugar and mix Irish cream or whiskey (or both!). Mix. Whip the whipping cream. Put whipping cream and cocoa powder in separate bowls on the side. Prep the tea the day before. But if you don't have time, cut the water amount in half and add the other half with ice instead. Brew the loose tea leaves with hot boiling water. Let it steep for 3 minutes. Strain the tea leaves, Simply add the plum wine, chop/shred the ginger. Mix it all it in a pitcher and there's your mix. Put the ginger ale on the side in an ice bowl to keep it cold. Mix Champagne and lemonade in a pitcher. Chop and crush the mint and add it to the mix. Put the lemons or limes and pomegranate in separate bowls on the side. Put tonic water on the side in an ice bowl to keep it cold. It's easy to create your own concoction as long what your mixing all goes well together. You can add Mexican hot chocolate with coffee and coffee liquor, or use different fruit juice and fruit with vodka or gin. But if anything, Martha always has tons of good cocktail recipes! And at Drinks Mixer you can find thousands of drink recipes...from the classic drinks to the really unheard of ones...anything you're looking for, they have it all. We hope that this can come in handy for any celebrations! Happy New Year! The latest surprise of the holiday season: a new furry addition to the family! Meet "Partner" my Step-Dad's new Border Collie Puppy! Believe it or not, photos do not do justice to the extreme cuteness waves emitted by this little guy. Their existing dog Dino (my childhood pup) cannot help but be kelly green with envy. Forgot to mention about my recent tiring yet exciting trip to NY.... When I was there, I kept seeing people around NY carrying MUJI shopping bags, and it was killing me that I didn't have to time to make it there! 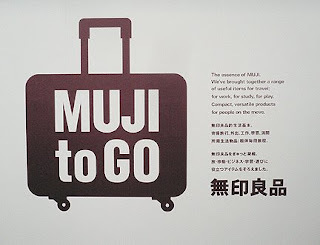 Thank MUJI! for their brilliance in opening a MUJI TO GO shop in JFK, I was able to compulsively buy great little everyday well-designed and thoughful objects from them!! (noticed I didn't say god?...cuz MUJI is it's own religion..my religion) I got this neat soap sponge dish where it drains the water while allowing air flow to keep the soap dry same time!! So no more picking up soggy wet slippery soap, then dropping it & slipping on it and crack your tail bones on it. I hate that! Raise your hand if you agree with me....yeah! I know! Nobody likes craking tailbones on SOGGY soap. eew. 12:00PM-get a wake up text from Chika wondering why I'm not at work and I text back "I'm up"
3:00PM-check on Chika to watch more daily show clips and admire Jon Stewart's wit and charm together. ahem...okay...I'm starting to think the whole filling in everything-I-do-during-the-day is NOT such a good idea....I'm just gonna write in "work from 10-6pm." DONE. 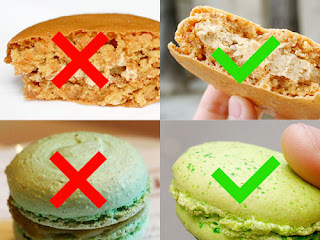 Ah..French macarons....oh! oui oui...how I love thee. I mean, who doesn't, right? They look and taste like perfection and heaven in every way. I've been wanting to make them. But every time I start reading about how to make them, I always just give up before I even try....fearing that I would fail miserably. I read all the warnings, the unsuccessful stories, and the mixed approach and opinions from friends who made them, blogs, food forums, and so on. It's been a year or more of thinking about this and I've yet made them..... But I'm tired of being scared of these macarons! I finally decided to confront my own fear by approaching it with an entirely new mentality....and that is...."I'm going to fail and make the ugliest French Macarons ever!" I did my share of research...and got some great tips and tricks from Coco&Me, Syrup And Tang, Serious Eats, some Forum and of course Martha for all the things I need to know to prepare myself a little bit. Check. Check. Check. Then I look over to the counter....there was one little bowl with some ingredient still remains....it was a quarter cup of granulated sugar that I had forgotten to put in!!! OMG!!! Serious!? I threw a total hissy fit since Dylan was supposed to read the steps to me...It's complicated..... okay, well... he was using the computer, and I didn't want to kick him off the computer entirely and just thought that he's CAPABLE of reading at least straight from the recipe that's right in front of him!!! I trusted him! But NOOOO, he said because he was multi-tasking on the computer, he was too "distracted", and didn't mention to throw in the granulated sugar while I was making them!!! I think I'll make another attempt soon now that I've conquered my own fear. So much for the year of mental preparation and then somehow ended up putting our relationship on the line...and all because of these damn macarons!! I hate you for being so difficult! ....oh! I'm sorry...I didn't mean it!! I'm saying things that I don't mean.... You're so tasteful and delightful!! 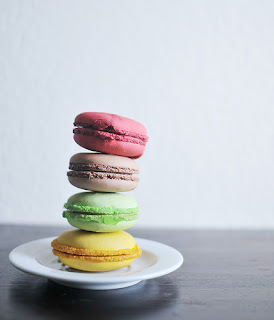 I love you, macarons! We mostly walked & slipped around Ballard in the snow to do some of our holiday errands...and some playing, of course. Here's what we accomplished during the snow days... Found some vintage ornaments at the Goodwill....check out those cool faceted ones! Re-decorated some messed up L&G ornaments...Dylan drew the weird squirrel's inside... I drew the giraffe with a bow and plaid pants....plus some other random fun doodling! Decorated our tree and window sill...ahh, so festive now. Made some peppermint hot coco.... Just blended some candy canes with some warmed up milk and coco powder and voila! Super yummy holiday drink! 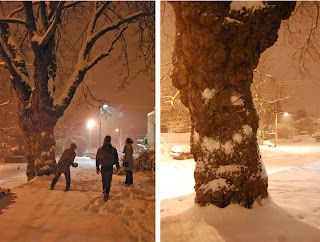 Dylan, Chika, Jared, and I played in the snow at midnight...they threw snowballs at the tree and made a smiley face. And I thought traveling to the east coast doing 3 shows in 2 days was hard...no, no, no...this is WAY harder. Being forced to walk around in the snow taking photos, decorating our tree and home, and drinking hot coco? ?.....yeah, life is hard. This is about me sharing my first hand encounters with couple of inspiring figures that I personally look up to... I got to meet the spunky, adorable and hilarious Amy Sedaris in person at her book signing event at BUST Craftacular show, AND the lovely and sweet Lotta Anderson from Lotta Jansdotter at another show at Divine Studios. This was a total highlight of our trip despite the rough week we had preparing for it. As if meeting Amy and Lotta wasn't good enough... The following day, Nam gets an email the about a sale and studio opening at Lotta Jansdotter! So Chika, Nam and I went to her beautiful studio...saw her amazing space and got some more Lotta items on sale!....I got the Japanese "Handmade Project"book (a lovely book with great photos and projects), a 2009 calander tea towel, and another tea towel. I wanted to get more stuff, since I wanted everything. So, you're probably wondering where all the photos of Amy, Lotta, and Lotta's studios are...since I'm a camera freak and rarely put my camera down.... All I have to say is that...I hate myself. I didn't bring my camera with me on the trip. I got so rushed before the trip, that I didn't get to charge it and just thought that I wouldn't be needing it since I was just gonna be working most of the time.....BIG MISTAKE!! The ONE time that I decide to leave it and then all these exciting things happen....So...yeah...this is it....I have nothing to show except this blog entry and the sad lonely photos of the actual items I brought back. Yup....This is as good as it gets. Where were you when Seattle design blossomed?? 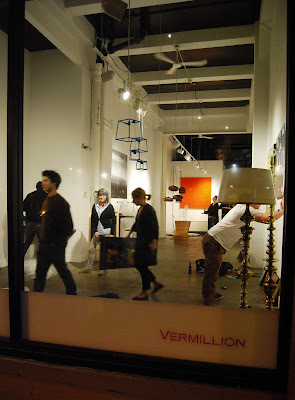 Ok, maybe the title is a little dramatic, but I can't help but feel giddy after resounding success of JOIN: Design Seattle's second opening at the Vermillion Gallery last Thursday! Everything came together to be an inspiring display of refined, unique, varied, viable products. Amazing job everyone involved! Special props to Jamie and Brian from Iacoli & McAllister for putting the show together. Also thanks to the Vermillion for hosting us. If you're in Seattle, definitely check out the show and the space (which has an adjunct bar/eatery in the back). The show runs through Jan 4th. Close up of Submaterial's felt wall hanging...all 900+ cut and assembled by hand! Gray Pant's genius cardboard lighting. Photography can't describe how awesome the light travels through the cardboard layers in person! Meet Me Here's bags: Jean just had to buy one! Ladies and Gentlemen first studio project: AlphaBrass! Stay posted for more info on our projects. JOIN Design Seattle Show: Ready to Rock! If you're in Seattle, there is only one place you need to be tonight: The JOIN Design Seattle show at the Vermillion Gallery from 6-11pm. For more details, follow the link. There will be an one-day only sale at the opening with some great smaller affordable items such as holiday ornaments, jewelery, bags and more!! Can't miss it!! We just got back from setup where we witnessed first hand how sweet the show is going to be. Everyone's stuff looks great in the space and we're so psyched to be able to participate. Oh My! L&G on Oh Joy! L&G got blogged on one of my favorite blog...Oh Joy! 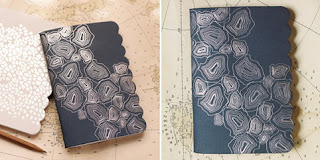 Joy's blog shares an aray of inspiration from handmade goods, to international designs, to homegoods, to fashion and beyond. 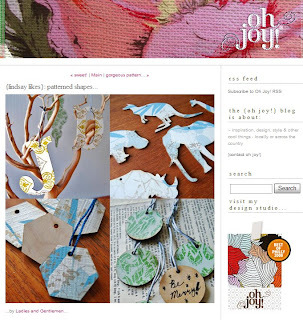 Not only does she have a fantastic blog, she also has her own line of beautfiul paper goods, Nantaka Joy and runs Oh Joy Studio. Just reading about her client list, accomplishments and work makes me feel like I'm the biggest slacker! I feel shameful.....How does she manage to do it all? !....only god knows...and I suppose Joy herself would know, too. In any case, I was thirlled to be mentioned on her blog...or should I say that I was more overJOYed! eh? On top of all other mayhem this holiday season, we're super excited to be participating in a design show that is showcasing NW design. 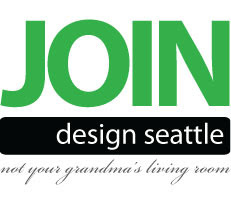 It's called JOIN: Design Seattle and will be taking place beginning at the opening on Dec 11th at the Vermillion Gallery in Seattle. We're presenting two separate but related projects that look at ways to re-represent classic forms of vintage objects in ways that showcase their inherent qualities. Just like the goods in the L&G store, our goal is to help facilitate an appreciation of existing objects. "AlphaBrass" is a series that re-formats ornate brass lamps in ways that enhances the varieties of classical forms they are available in. 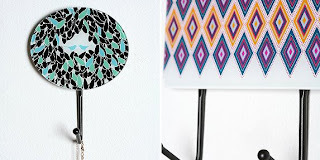 These lamps are modular, so the potential to mix and match is limited only on the supply available from local thrift stores. Adjusting scale, paring down details and reiterpreting function will hopefully promise to add value and appreciation for these typically stuffy living room fixtures. For "Mega-doily" (the second project), Jean has taken her new found appreciation for crocheting doilies and channeled it into a grand interpretation of the common table top item. The result is an area rug with a satisfying knobby texture and bold graphical presence. There will be more posts on both of these featured as we wrap up the final details and get these to the Vermillion just in the nick of time. If you're in the Seattle area, please please come visit us and come see it in person plus 6 other designer's work!